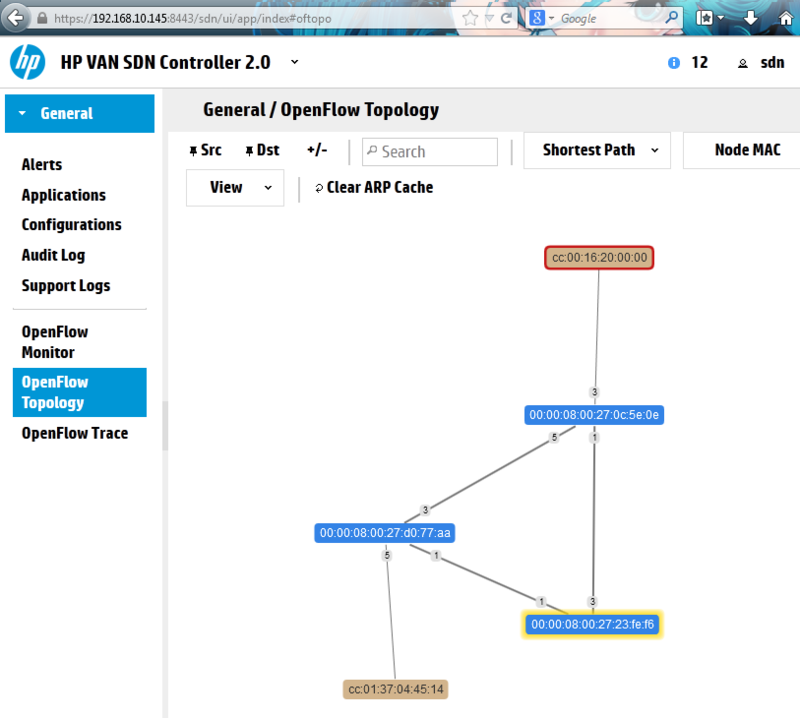 So, HP has made one if its significant moves last November (2013) with the first public release of their OpenFlow based SDN VAN Controller 2.0. And because you can download it for free in 60 day trial as an ubuntu package, I wanted to create a nice environment for myself where I can play with it and some OpenFlow enabled switches effectively. This I achieved using the good old GNS3 simulator and importing VirtualBox linux hosts there, one for the SDN controller running on ubuntu system, and several small debian systems running Open vSwitch that will act as OpenFlow SDN switches. 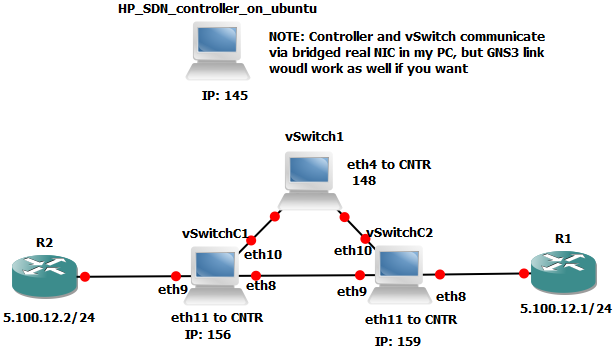 Step 1 – clone your virtual vSwitch system to have more switches for topology. And we want it all inside GNS3 to be able to play in virtual environment anytime. The two cisco router are actually only simulating end PCs in this particular case, but can also be routers in a more complex SDN environment. 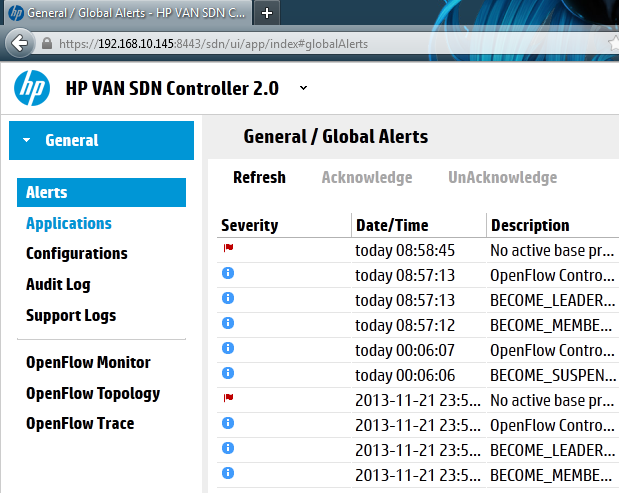 The HP VAN SDN Ccontroller 2.0 is a new initiative from HP to create an open ecosystem for SDN networks. The controller supports some basic functions like doing L2 switching or L3 routing, but with open API (REST API) and programming interface in Java, anyone can build an application on top of this controller for any additional functionality (firewall/load-balancer/cloud interface). To be honest with HP there is a room for scepticism if this ecosystem gets beyound critical point to become popular. BUT at least it is an OPEN solution in sharp contrast to the currently released Cisco ACI (Application Centric Infrastructure), which is basically the SDN idea, but completelly locked to Cisco proprietary environment/protocols and only supporting the new high end Nexus 9000. So I personally would rather have an SDN network based on OpenFlow where I can replace underlining switches and controller with anything I want (even open source) instead of being locked with Cisco. First question that I will answer is why using ubuntu, it is because the HP SDN Controller is not really yet so flexibile to work without issues on other distributions. Believe me because I tried first on Debian and I spent 4 hours troubleshooting dependencies on various packages (mostly because the developers chosen most newer versions of packages even beyond testing branch). So I really recommend you simply install ubuntu 12.04 and then follow the HP SDN Controller Installation Guide (backup link) absolutely step by step. NOTE: Including the part of using the ubuntu cloud repository and definitely use the recommended Java 7 update 25 on your computer (the one where you want to use the GUI) because other Java systems will simply not work! Then we can check if the service is running be either checking the process status, or we can check if there is a Java daemon on TCP 8773 port. And finally, we can login to the SDN controller on https://localhost:8443/sdn/ui/ , the username is sdn and password is skyline. Once you login, the basic GUI view is very simple (and quite empty at the beginning). The last point is getting a license for your installation,actually the best way is to go for HP VAN SDN Controller License Registration and Activation Guide. First we install curl to ubuntu. Then we ask our controller (running on 192.168.10.145 in my case) for “token”. Now, this is the bad part guys, the licenses are pay walled :(. If I find a way how to get it free (I have it as HP employee), I will update this part. REMARK: The HP SDN controller is a paid product, but for HP employees (as I am). 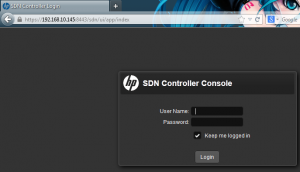 For anyone else, there is a link on the HP SDN Controller homepage for a 60 day trial, but I haven’t tried it myself to get the license this way. So sorry that I cannot help more, by you will have to get a license yourself somehow. We take the token from Authentication, and use it for license insertion to the controller. Here is a quick guide how to compile and install an Open vSwitch kernel module in OpenFLow mode. We will use this vSwitch daemon and install it on minimalistic debian to create for us a nice SDN switch usable in GNS3. Next, enter the directory (I recommend that you read the INSTALL files, which I admit most of this vSwitch installation is based on). I have omitted the output as it is a very long and boring one, but make sure there are no errors in your execution. The configure script is technically checking if you have all the libraries and compilation tools needed in your system, if something essential will be missing, it will stop and exit wit error that you must solve to continue! Now if you haven’t used root for the previous commands, for this last one you have to become root or used su command. The last command is make install that will move all the compiled vSwitch binaries to correct places in the system. Then, create a folder for vSwitch database and initialize the database. Then we can start the vSwitch database deamon that is called ovsdb-server. Following the database start, you can start the main vSwitch daemon itself called ovs-vswitchd. You have the vSwitch up and running now, but with empty configuration. What we need is to create a basic port configurations (add physical interfaces to be controlled by Open vSwitch in OpenFlow mode) and then tell the switch where the controller is located. 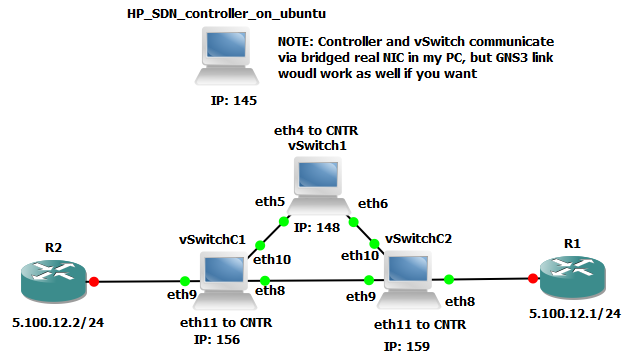 eth4 – this interface will not be touched by the vSwitch and will be used by classical linux system to allow communication between the vSwitch and the controller. 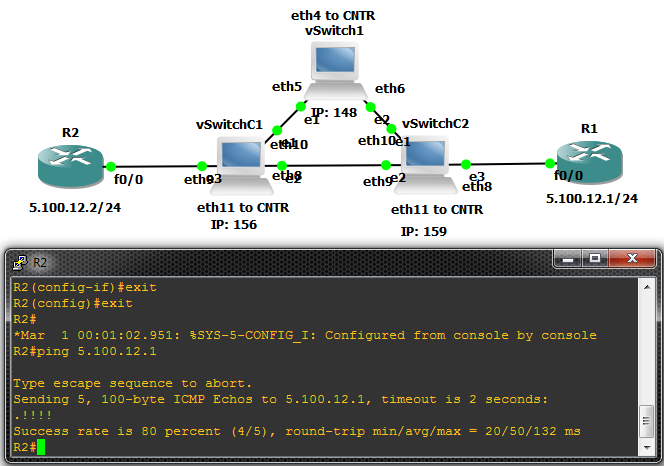 eth5, eth6, eth7 – these three interfaces will be used for connecting to other GNS3 switches/routers/hosts. This is how I will configure it, first let’s create a virtual switch called ofbr0. You can then check the interface status by your vSwitch with the ovs-ofctl show ofbr0 command as shown below (the ovs-ofctl is your main interface to talk with the OpenFlow vSwitch implementation). Then you need to configure the controller IP and port where the vSwitch will try to connect and be controlled from. This is a simple ovs-vsctl set-controller ofbr0 tcp:X.X.X.X:port. 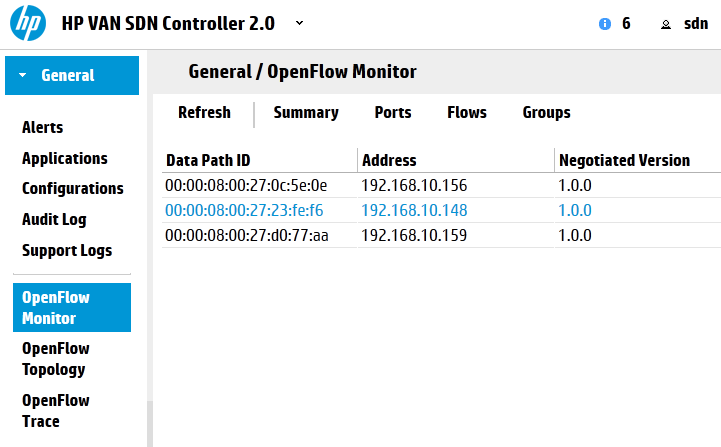 To verify that you correctly configured the controller, vSwitch ports and the communication between the controller and the vSwitch is working, go to the HP SDN controller GUI and open the OpenFlow Monitor. Inside you should see your switch registered (my vSwitch has 192.168.10.148). 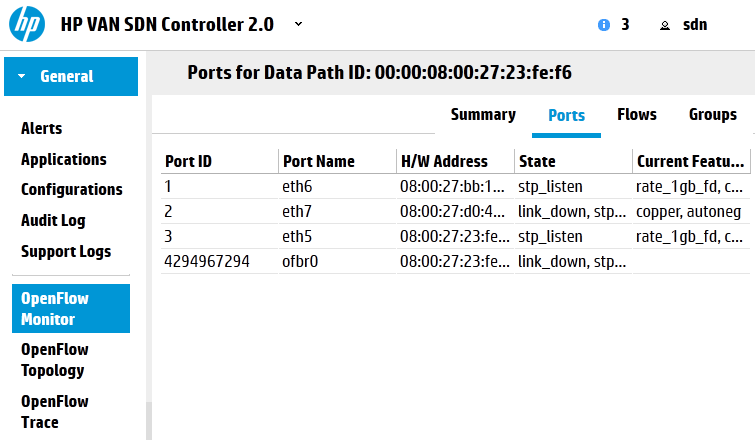 You can also check the ports inside the HP SDN controller by selecting the switch and clicking on “Ports”. Ok, so we have both the controller and the Open vSwitch, lets put them both to GNS3 and try to interconnect them. In VirtualBox (and also vmWare), you can clone the virtual system and create an identical copies. Do this with network MAC address re-initialization to create a unique set of interfaces in each system and create three vSwitches. 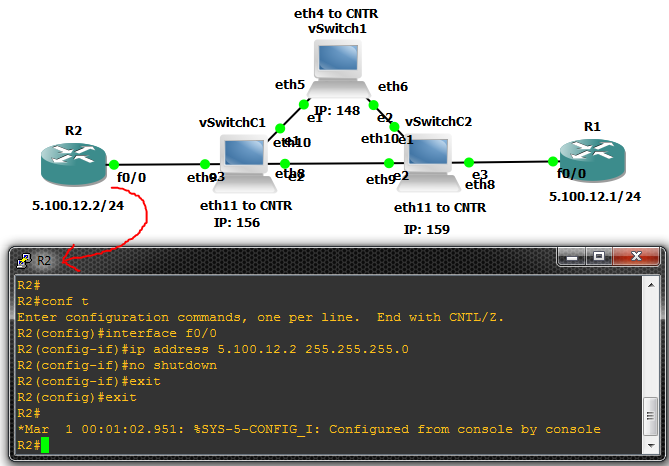 Then add them to your GNS3 LAB topology via VBox API. 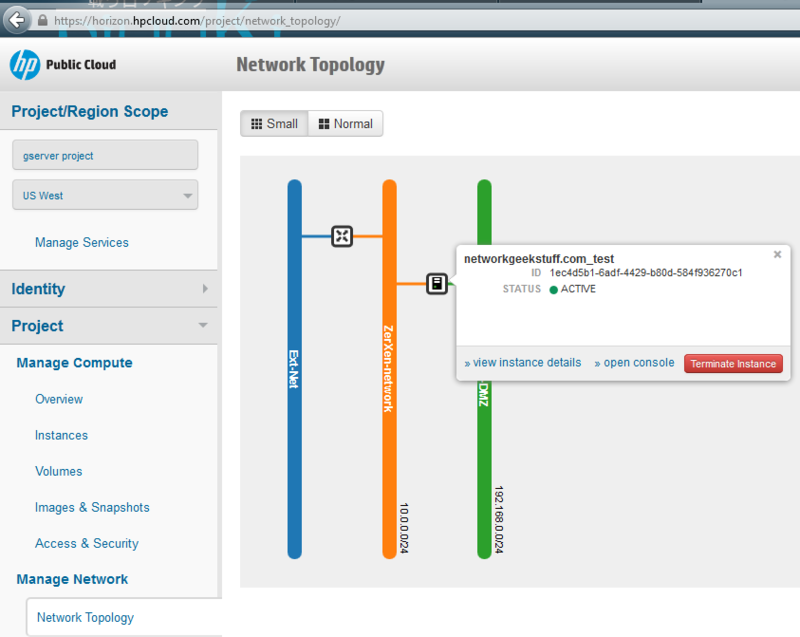 Create the GNS3 topology, you can create your own design, my image below is simply an example. Configure all three vSwitches to connect to the HP SDN controller and to use the needed ports in the virtual switch instance just as I showed in Part II. Then you can check the HP SDN controller is seeing the switches. Ok, guys, now the magic part. 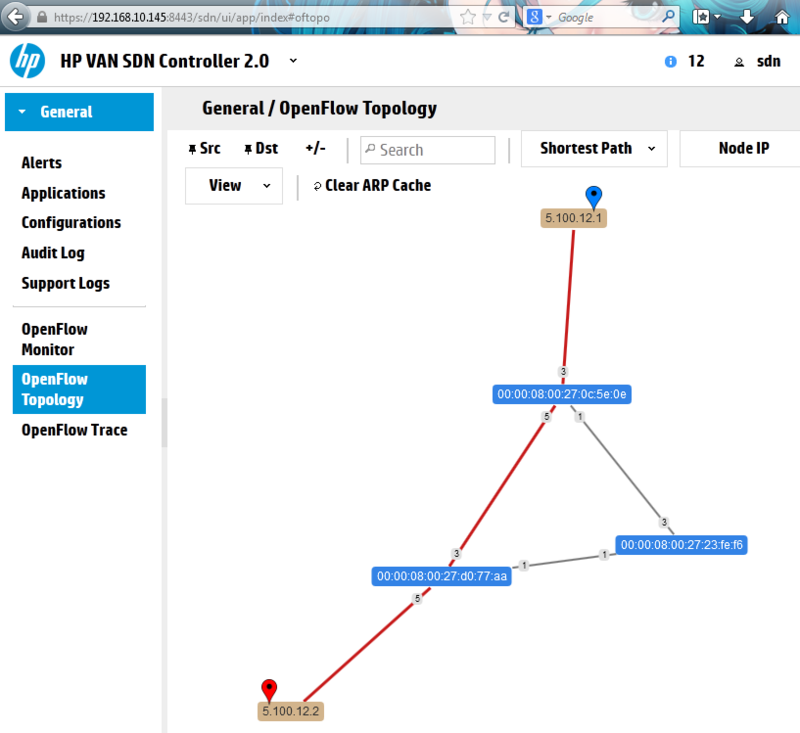 Have a look to the “OpenFlow Topology” view and you will notice that there is already a small map of our lab topology there. Next, configure both routers with their IP addresses (inside same subnet). This is trivial and I am only showing this for completeness if this article is being red by non-network technician. Now you should be able to nicely ping between the two routers because the HP SDN Controller would run Dijkstra algorithm to find a path through the network. So lets try the ping between our two hosts. To see the Dijkstra algorithm path from the HP SDN Controller point of view, the Topology Overview provides a feature to switch the nodes view from mac-address to IP and to simulate the traffic path by selecting source/destination on the nodes, the results of this is visible below. In the very end I must say that the L2 functionality that is in the core of the release the SDN seems to work. I also played with some outages and will try to move from virtual GNS3 lab to a physical lab utilizing some HP switches that have OpenFlow support already. But the biggest lack currently with the HP SDN Controller is a simple lack of more applications on top of the controller. For example the is not even yet any L3 router, not to mention firewall or load-balancer. Hopefully this will all change when the SDN app store will be opened. There are already some partner companies developing more applications on top of the HP SDN Controller, but I haven’t seen yet any reall product that would make the HP SDN really applicable in a production environment. Right now, this SDN from HP as vendor is only usable in lab environment and for basic L2 switching, it you want to develop your own applications you can already to so using the provided java JDK and API, but I believe 99% off all people readying this are interested in deploying SDN as a complete solution, and do not have the time/resources to develop custom SDN right now (like google did). So it is a waiting game with SDN in labs for most of us (including me), but the future for datacenters definitely looks interesting with many SDN companies trying to enter the marked. PS: Just as a quick remark that much more is happening inside HP and the SDN/Cloud is the interesting project inside HP that is called the HP Public Cloud – www.hpcloud.com, which is actually a whole Cloud (similar to amazon or oracle cloud) on top of SDN/OpenStack, but using custom controller really. And with the new user panel called Horizon, it allows you to quickly spawn and Infrastructure as a Service (IaaS) including networks, routers, servers and currently a load-balancer in beta (firewall filtering is internal mechanism so no dedicated firewall needed). Some pictures below for inspiration how I was playing there in a free 90 days trial. Hi, I am facing problem opening SDN UI. Output is nil after entering “root@hpsdncontroller:~# netstat -atupvn | grep 8443” command. Can you share the possible issue and solution? Alternatively, you can try to look if the controller is running in the linux process table, check “ps -ef” command and try to find something related to the controller. Thanks. I was able to make it running. I have another doubt. I am trying to use RESTAPI to interface with controller, can you guide me? I have gone thru HP RESTAPI guide . However I am not able to connect? I haven’tt yet played with RESTAPI, so I cannot help you much with HP controller+REST API combination. I have installed the HP controller and opened the UI successfully. Can I know how to stop and start the controller ??? And one more question,Is license is mandatory to run the controller ?? The license is not mandatory to run the controller. I have well installed the controller and services are up and running. I think I had the same issue, check the installation/administration guides from HP that I linked at the beginning. I think there is a note/warning there that you must have a specific version of Java installed in your PC in order for the controller to work. I think it was Jave 7 update 25. Anything before or after this version is problematic …. I have tried installing the SDN controller on multiple ubuntu 12.02LTS and 14.04LTS VM’s. All successful installations. Although when I access the Web UI I cannot use the SDN – SKYLINE username and password. If I check via the CLI if there are any usernames and passwords, the server does not return any results. Can I add users via the CLI so I can use the new account? Anyone else have this problem? 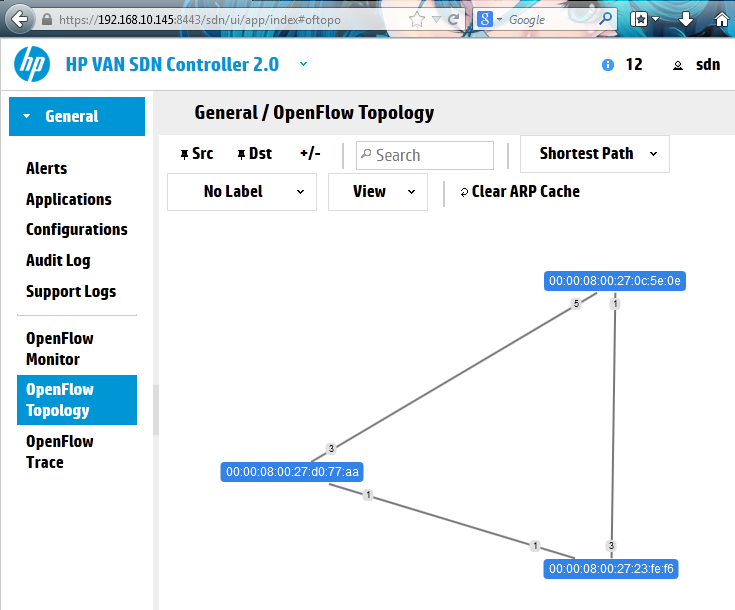 I used the “HP VAN SDN Controller Installation Guide”. i’m trying to install HP SDN Ctl 2.3 so I can install Network optimizer SDN for Lync for testing in our company’s lab. for some reason I cannot log into the controller UI using the default sdn / skyline credentials. were there changes between 2.0 and 2.3 version? the installation guide stated something about “Creating a user using a script” which I can not get it to work. 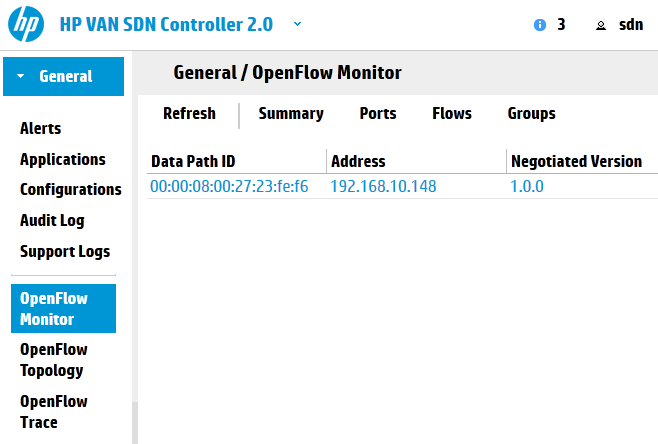 Have a look at the SDN controller 2.3 installation guide, the process has changed a little since the 2.1 version mentioned in my article. You can actually find the whole bash script in the install guide that you can just copy&paste to a file and run. It will create for you the whole SDN/skyline username with the KeyStone system downloaded from ubuntu repositories. The above link when hit with Chrome it is not able to open the UI. If you have any info on this how to see the UI appearing kindly share. when hit the UI of SDN controller is not appearing at all. This is a very easy and nice lab tutorial. 1) What is the necessity to reserve 1 phy interface to connect controller. Can’t it be done with virtual interface. 2) If I do not have much physical interface in my pc… Can I dedicate only 1 phy interface instead of 3 physical interface for OVS switches? What would be the impact? Appreciate if you can reply. Thank you. Can you help me understand how can i apply this repo to 14.04.3 LTS please? gives me an error stating add repo command not found. 150 tables and then closes the connection. Is it that the controller is not able to fetch all 256 tables ?